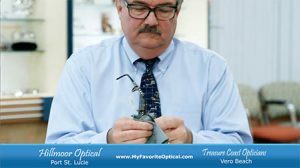 NEVER purchase decorative contacts without a prescription! Halloween is time of fun and creativity, and decorative contact lenses have become increasingly popular over recent years, but they are NOT over-the-counter cosmetic accessories, and they are NOT one size fits all. NEVER purchase decorative contacts without a prescription! A poorly manufactured or poorly fitting contact lens can be downright scary! Improper lenses can cause scratches on the cornea (the clear dome of tissue over the iris—the part of the eye that gives you your eye color), corneal infection (an ulcer or sore on the cornea), conjunctivitis (pink eye), decreased vision, and even blindness. * Don’t let impulse get in the way of good judgement, If you’re looking for decorative contacts to complete your costume, purchase them from a reputable optician and shop early so there is plenty of time for the delivery. We will be happy to set up an exam so you have a current prescription. Just give us a call at 772-337-6377. Open M-F 9 a.m. to 5:30 p.m.